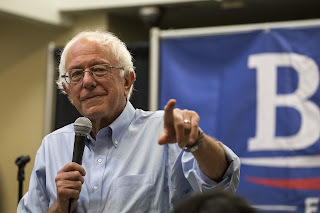 I may not be an American, however, I have been following the upcoming Presidential Election closely, and there is no doubt in my mind that Bernie Sanders should be the next president. The mid 70's Democratic socialist, is in my opinion, the candidate whose policies are most relatable and just. I'm not a political aficionado by any means, however, Sanders is on the right path, his stances on topics such as health care and free college tuition are steps in the right direction. Australia for example, has free health care under their scheme called medicare, and also subsidies university fees with the Government funded scheme known as 'HECS'. Australia proves that these things Sanders wants to implement, can be done. Before anything else, Sanders has to overcome Clinton for the nomination of the Democratic party. The problem is however, that currently with the amount of delegates Clinton has over Sanders, this does not seem unlikely. As a Sanders supporter though, I do believe in him and still cling onto that glimmer of hope, even if the maths is not in his favour, he can turn things around. This may not indicate much, but watching a plethora of Youtube vidoes of both Sanders and Clinton, I couldn't help but notice the like/dislike ratio. Sanders almost always is in the green, with a huge majority pressing the like button however, the same can not be said to Clinton. In almost every video which Clinton is featured in, the bar is ever so red and disapproving. The Youtube comments are even more hostile for Clinton, with many up voted comments announcing their disdain for Clinton as president. Many will pinpoint the fact that Sanders is a socialist, and is out of his depth however, as an outsider looking in, I can agree on almost all of Sander's main talking points. The Presidential hopeful is aiming to restore America's middle class, all over his social media outlets, there is a strong emphasis on taking away money from the major corporations, and promoting wealth equality. To me, these are not only policies, but also key foundations for a prosperous society. As an adolescent myself, some sort of college subsidising would be instrumental for the next generation of Americans, degrees cost exorbitant amounts of money, and they do not even come with a guarantee of a job to pay off the debts. Free healthcare is a must have for any society, and paid leave, Sanders is preaching the cores for a well-functioning society. Overall, Sanders is just very likeable. Watching him on Youtube videos, his radiant smile and affable personality is very likeable. Even with his age, he is able to keep up the energy to match the more younger hosts. If Sanders fails to win at least the Democratic nomination, it will be a definite disappointment. With a loss, it would be unlikely that Sanders would run again for the Presidential throne. This would be a shame, since Sanders seems the most well-grounded and sophisticated out of all the hopefuls. I love rooting for underdogs, and there is no more quintessential underdog than Bernie Sanders.